How many of us have agonized over our book cover? How to make it eye-catching? How to write a blurb on the back that engages readers and makes them want to buy the book? How to create a cover without breaking the bank, yet not look amateurish? One of the most challenging aspects of being an independent author and publisher is the cover design. 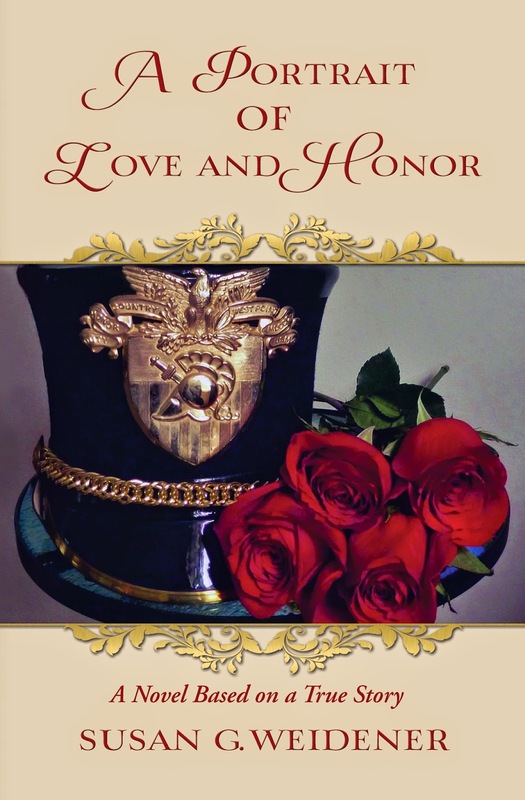 So here I am unveiling the cover of A Portrait of Love and Honor . . . and what went into designing it. I'm excited, I love my cover, and I hope you do. 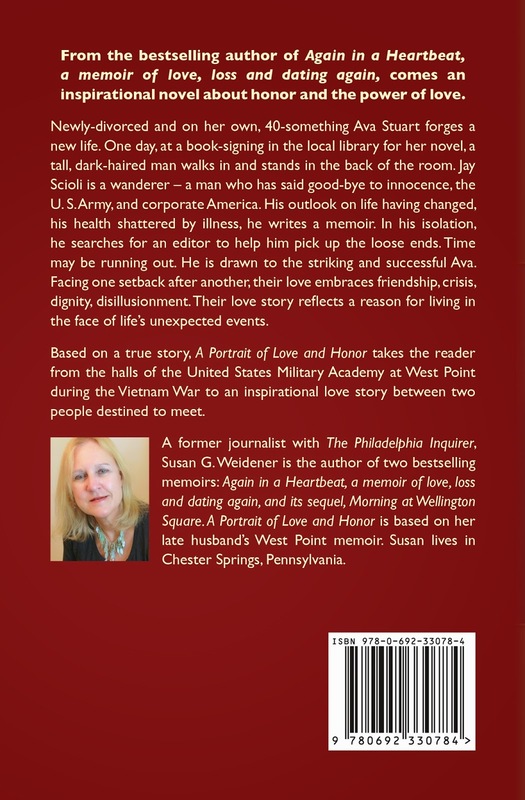 A Portrait of Love and Honor is a love story and a novel based on a true story—John’s West Point memoir. His memoir was never published; nor was it published when he tried to sell it as a novel. We worked on it together, but his illness soon consumed us. This project is a personal journey. I wanted my cover to reflect that. At first, I considered a cover with two people walking hand-in-hand down a road. Hiring someone to render that illustration seemed complicated. What would the people look like? The book's genre is literary fiction. I've seen many covers where the people look like they belong in a video game. I didn't want that. I researched agency and freelance design fees - they began around $750 (if you supplied your own image), moving upwards of $1,600. As with my memoirs, I was working within a budget. With a quality point and shoot digital camera, (mine is a Lumix Panasonic with Leica lens), an eye for color, good light and a clear concept of what your story is about, your cover image reveals itself. A photograph that didn't make the cut. I wanted a cover conveying the theme of a romantic story, along with a man’s story of West Point. The cover needed both the feminine and masculine touches; the flowery font for the title which stands out and the heavier, more masculine one for the subtitle and author name. John’s West Point hat from his days as a cadet and the crimson roses Jay gives Ava in the novel added to that. I worked with my design team at Amazon's CreateSpace. Kristin understood what I wanted because of the questionnaire I filled out and the photograph I supplied. She and I also talked about the story. CS charged $399 for cover design, which is up $50 from two years ago. They also reduced the number of cover concepts. It used to be three, now it is one. I did receive two concepts - one in black and gold and the other in cream and red - because I supplied my own image and told them I felt one was insufficient. One concept included my name at the top; the other, the title of the book at the top . . . and a choice of fonts. Changes and edits can cost $49 for each new round after the initial changes so know early on what you want. Again, I sought the opinion of several people. All but one person preferred the red and cream and the title at the top. Hiring a professional meant collaborating with people trained in design and graphics. It’s worth the money. That said...we’re artists, aren’t we? While there is an abundance of fine illustrators and graphic designers, have confidence in your artistic taste and talents. The best concept is often within you. No one knows your book as well as you do. The Synopsis/Blurb on the back. Be able to answer the question: What is my story about? If you can write that, you're on your way to "hooking" and intriguing your readers. Run it by your developmental editor, someone who, like you, knows the story inside and out. I was limited to 250 words on the back so tight writing is essential. Final note: Work to get advance reviews from a well-known author. I’ve done that and may soon have an exciting announcement. Even if it won't go on the back of my book, a two-line endorsement from a bestselling author can be highlighted on my Amazon Author Page. Designing a book cover you love is one of the great joys of the indie publishing experience. Creative control is yours. Have fun with it.